Arnold López is a Mexican-American from Lennox, California, located just a stone’s throw away from the Los Angeles International Airport. Arnold earned his B.A. in Latin American studies and mass communication from the University of California, Los Angeles in 2010. He returned to his alma mater to pursue his M.A. in urban and regional planning, with a concentration in transportation and housing, graduating in May 2015. Arnold has managed anti-violence programming in Los Angeles, assisted with outreach strategies to minority populations – including women, non-English speakers, and persons with disabilities – and consulted on transportation planning initiative for low-income communities. Arnold’s professional and academic experience has provided him with an eclectic background in community development and driven his motivation to continue pursuing solutions to issues of urban planning. Also having worked with the AFL-CIO, Arnold has strengthened his research and advocacy experience around immigrant labor rights and protections, particularly under executive orders Deferred Action for Childhood Arrivals (DACA) and, prospectively, Deferred Action for Parents of Americans (DAPA). 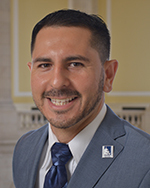 As a CHCI Housing Graduate Fellow, Arnold hopes to utilize both his didactic training and his set of tools learned from his professional experiences to advance national legislation on affordable housing and economic development for low-income communities.